Originally published in 1996, updated through 2000, the 2011 edition carries further edits to the first published work. This book consists of six narrative chapters and thirteen appendixes. Chapter 1 contains a brief history about the origins and history of the French people. Chapter 2 contains the original text about the early Ditto families of Maryland and other States as written by the late U.S. Navy Captain W. Lester Richards in his unpublished manuscript, “Ditto’s Delight.” In Chapters 3 and 4, the writer discusses the brothers William Ditto [II] and Henry Ditto [II], who moved from Maryland to Kentucky in the late 1700s, and their Descendants. Chapter 5 discusses William Ditto [I] and his son James [II] who moved from Baltimore County, Maryland, to Chatham County, North Carolina, circa 1750, and their descendants, who live today mostly in Alabama, Ohio, Tennessee, and Texas. And, in Chapter 6, the writer discusses a separate line of Dittos who descend from the immigrant Joseph DeToe or Ditto, who arrived in America circa 1750 and settled in York County, Pennsylvania, and whose descendants live mostly in Ohio, Illinois, Iowa, and California. To support the family information contained in the narrative chapters, there are thirteen documentary appendixes, which provide Ditto extracts of official census records, probate, deed, tax, and marriages. Also, the appendixes contain lineage charts of the four main lines of the Ditto families which will enable their Descendants to trace their descent back to their immigrant ancestor. This book is the culmination of about sixteen years of “off and on” research in Maryland and Kentucky and about six months of concentrated effort in 1995 and 1996 to prepare a “camera-ready” manuscript to send to the publisher so that at last the readers can hold in their hands this History of the Ditto Families. Circa 1980, I sent an inquiry to Mr. John H. Ditto, Attorney-at Law, in Ellicott City, Maryland, regarding the Ditto family of Maryland, and he replied that Captain (USN-Retired) W. Lester Richards of Palm Coast, Florida, was in the process of compiling and writing the History of the early Ditto Families of Maryland and Kentucky. I rushed a letter off to Captain Richards, and he sent me a Xerox copy of his work entitled, “Ditto’s Delight.” I nearly “missed the boat” (not a Navy expression) on the Dittos, but thanks to Lester and his wife Edna for sending me the copy of “Ditto’s Delight,” I was able to respond with some copies of interesting records extracts from Shelby and Hardin Counties where the early Dittos resided in Kentucky. Earlier, Lester had been corresponding with interested Ditto Descendants from around the country who had furnished him with various information from their files and the copies of official county records on the Ditto lines from whom they descend. I had just come aboard and had become excited in learning about the Dittos of early Maryland. In our exchange of correspondence, Lester wrote that he was a graduate of the United States Naval Academy at Annapolis, Maryland, and I wrote back that I was a graduate of the United States Military Academy at West Point, New York. Right away, we found out we had another thing more or less in common, other than being Descendants of our respective Maryland and Kentucky Ditto lines; we both were graduates of sister service academies. Thereafter, our collaboration in Ditto family research became an urgent joint “Army-Navy” effort. But, unfortunately, a couple of years later, Lester became ill, could not continue with his research, and then passed away. The information copies of records which I sent Lester over about a two year period helped him to understand the Ditto lines of Kentucky much better. I was born and raised in West Point, Hardin County, Kentucky, and I knew many of the older Dittos living there at the time. In fact, members of my Shean family always took the time to visit with Aunt Nannie (Ditto) Shean and her daughter Loraine, and the two families were very close. Aunt Nannie had married Harlan Elsworth (Elzy) Shean, my grandfather’s brother, but Uncle Elzy died a couple of months after I was born. Therefore, as I was growing up, I heard stories about the Dittos and the Sheans who had lived on “Ditto Hill” long before my time. Also, I was acquainted with a few members of the Ditto families living in the town of West Point. But, strangely, until I began my research, I never knew that my Grandfather Shean was descended from the Dittos of Shelby County, Kentucky. Even members of my Shean family were unaware of this connection, because an early death in one of the past generations had left a void of family knowledge. Our earliest Shean ancestor to settle in West Point was Charlton D. Shean. Although I have found no official records in which his middle name was written out, I am now convinced that it was Ditto. His mother was Milcah (Ditto) Shean of Shelby County, Kentucky. She was the daughter of William Ditto [II], who brought his family to Shelby County from Harford County, Maryland, in 1794. Therefore, with the new information about the Dittos of Maryland, I then turned to my lifelong friend Richard Briggs, in West Point, Kentucky, and we compared notes on the Dittos of Hardin and Meade Counties. Richard had a wealth of information on many of the early families of West Point. He pulled out a big genealogical chart he had prepared on the Dittos of the area. Over the years, he has become the town historian and has published several books on the history of the town and many of its old families. Also, he has engaged in activities which have helped to promote the economic viability of the town as well as to educate all persons interested in its history. When I took him a copy of Lester Richard’s manuscript entitled, “Ditto’s Delight,” he was, to say the least, quite delighted. In 1995, I mailed out flyers to many Dittos throughout the United States and requested them to send me information about their families. At first the effort was rather slow, but after a while, it began to pick up steam. Several people responded with good data about their families. Then, I wrote a few letters and made a few phone calls, and I received still more information. In my correspondence years before with Lester, he had written me that one of the Dittos, James [II], left Maryland in the late 1700s and went to South Carolina. I have not done any research on Dittos in any states other than Maryland and Kentucky and knew nothing about them. In just one years’ time, I have learned much about the Dittos of Alabama and Texas. Most of these Dittos are Descendants of James Ditto [II] and his father William Ditto [I]. Also, I have learned much about those Dittos who descend from Francis Ditto, the Revolutionary War veteran, who was born in York County, Pennsylvania. The reader must understand that no one person will ever have complete knowledge of the extended Ditto families throughout the United States. I know somewhat more about many Ditto families as the result of my research and correspondence with many Dittos and Ditto Descendants over the years. However, my knowledge is still far from being complete. In the narrative chapters of this book, I have identified, as best as I possibly can, members of the early Ditto lines and have used original source documents (court records) to support my findings. The reader will quickly note that two-thirds of this book are extracts from official records (i.e., censuses, wills, deeds, land patents, personal property tax lists, marriages, and etc.). These records extracts are essential to support the information in the narrative chapters of this book; they provide the official documentation--or proof--you might say--at least for the Ditto lines of Maryland and Kentucky. Included in Chapters 5 and 6 are a few documents which help to confirm the Alabama-Texas and Pennsylvania Ditto lines. With the information provided by this book, most Dittos living today who are descended from the Maryland, Kentucky, Alabama, and Texas lines should be able to make a connection to an earlier ancestor by tracing back from the present with very little effort. I especially regret not learning more about the Milam County, Texas, Dittos, but if they know their family history, they should be able to make a connection to an earlier generation in Alabama. For those generations of today, I recommend that you review the Family Groups Charts which are in Appendixes J, K, L, and M to see if you can find and trace your line of descent. These charts contain the minimal vital statistics data, where known, and the basic sources from which the information was obtained. When you read these chapters, I hope that you will gain a better understanding of your Ditto ancestors and will appreciate the many hardships which they had to endure and overcome. The Ditto families of the 1700s and 1800s were pioneers who have contributed greatly to the development and the success of our nation. As Huguenots, they were forced to leave their French homeland in the 1500s and 1600s to seek religious freedom and to practice their Calvinist faith. They came to Colonial America, quickly assimilated, and contributed much to our great land. As Dittos and Ditto Descendants, you can be justly proud of your heritage, and it is your responsibility to strive and to live up to the past achievements of your forefathers. A review of this family history reveals many Dittos have achieved a considerable degree of success in the legal and medical professions. I wish you good luck and continued success. In the second edition of this book the reader will note that the Descendants of John Hugh Ditto of Meade County, Kentucky, have been extended to the present day (2000). In addition, the second edition has been revised to eliminate many typographical errors which appear in the first edition. 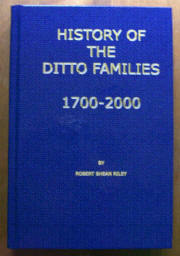 Read and enjoy your Ditto history and pass it on to your future generations!